The white cliffs of Dover, Beachy Head and The Needles have welcomed sea-faring travellers to southern England over the centuries. But there is more to the Cretaceous of southern Britain than magnificent chalk headlands for a wide variety of sandstones and mudstones occur in the Lower Cretaceous. It is these alternating hard and soft strata that weather into the hills and vales that perhaps epitomise the English landscape made famous by artists such as John Constable, Thomas Gainsborough and JSCotman. Inland the chalk forms the rolling countryside of much of Dorset, the Hampshire Downs, Salisbury Plain, Marlborough Downs, the North and South Downs, the Chilterns and their north-eastwards continuation through Cambridgeshire and East Anglia. 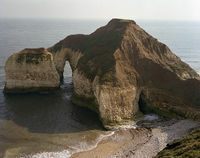 It underlies the Lincolnshire and Yorkshire wolds, and at Flamborough Head the chalk is carved into sea stacks, arches and wave-cut platforms (Plate P006784). Well-bedded chalk is overlain by thick glacial deposits of Devensian age at Flamborough Head. Only the upper 'flintless' chalk is exposed here. P006784. Early Cretaceous palaeogeographical sketch map. P785825. The relative fall in sea level that marked the close of the Jurassic Period was accompanied by an increase in tectonic activity (Late Cimmerian) related to rifting and opening of the North Atlantic. This continued into the Cretaceous Period so that early sedimentation was restricted to two areas separated by the London Platform (or East Anglian Massif). To the north, across the East England Shelf and Cleveland Basin, marine deposition continued in the Boreal North Sea Basin while to the south nonmarine sediments accumulated in the Wessex Basin (Figure P785825). Sea-level rise that began in the Aptian reached a maximum in the late Cretaceous (Campanian) and tropical or subtropical seas covered the London Platform. Initially, near-shore sand was deposited with clay in deeper water, but as the supply of terrigenous sediment diminished a thick succession of chalk accumulated, from which the Cretaceous Period takes its name (Latin creta chalk). At that time, Britain lay approximately 10º farther south than at present. 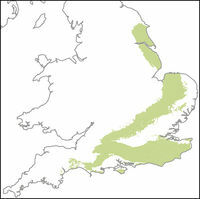 In the south, the Purbeck Group (K1) spans the Jurassic–Cretaceous boundary. The Cinder Bed, a marker bed of sandy limestone with crushed oyster shells was traditionally taken as the boundary but this has been revised (with the adoption of the Berriasian Stage) so that the boundary is lower, very near the base of the group. These beds were deposited in lakes, lagoons and on mudflats that were flooded by the sea from time to time, and include significant evaporites. Fossils include turtles, fish, ostracods, insects and tree stumps. Rock salt (preserved as pseudomorphs) and layers of gypsum formed during episodes of desiccation on sabkha — arid coastal plains just above high water level. The Wealden Group (700m proved offshore; K2) that overlies the Purbeck is also predominantly fresh-water in origin — braided rivers spreading sheets of sand on lagoonal mudflats. The water was shallow and there is evidence of drying out: desiccation cracks and dinosaur footprints have been recorded. The lower part is predominantly sandy; the upper part is mainly mudstone. Eventually the sea broke through (Aptian/Albian times) and a major transgression spread across the British Isles. The Lower Greensand Group (K3), including the Woburn Sands (Plate P213293) and Upper Greensand Formation (included with K4) are tidally influenced shoreline deposits with a rich fauna of tough-shelled marine creatures that could withstand strong currents in the nearshore environment. The bluish grey mudstone of the Gault Formation (K4) was deposited in deeper water some distance from the shore and contains the remains of more delicate thin-shelled benthic and pelagic creatures; the Upper Greensand is the nearshore equivalent. With the rising sea level the entire London Platform was submerged so that the Gault and the Upper Greensand overlaps the earlier strata: in Dorset the Upper Greensand rests on Triassic strata and in Devon on the Permian. Large-scale cross-bedding typical of sand waves in shallow tidal zones is well displayed here in the Woburn Sands (K3) of the Lower Greensand Group. The sands are overlain by Gault, Leighton Buzzard. P213293. The early Cretaceous of the East England Shelf includes a range of shallow marine sediments, the Spilsby Sandstone, Claxby Ironstone, Tealby and Roach formations (K1–2) and the Carstone Sandstone (K2). In the Yorkshire (Cleveland) Basin mud accumulated in deeper water — the Speeton Clay Formation (K2–3). Both sequences are overlain by the red chalk of the Hunstanton Formation (K4) that passes up into soft chalk of the late Cretaceous Ferriby Chalk Formation (K5), the lowest unit of the succeeding Chalk Group. Sea level rose throughout the late Cretaceous reaching its maximum level perhaps for more than 600Ma so that much of the continents were flooded. The Chalk Group accumulated during this period in warm water at an estimated depth range of 50 to 300m. Chalk is a pure, white limestone that accumulated from the skeletal remains of tiny coccoliths and foraminifera, and coarser fragments of larger invertebrate animals. Intense bioturbation indicates that it formed as a sludge on the sea bed, and this relatively stable low-magnesian calcite may have remained unlithified for some time. There was little input of terrigenous material; marl beds occur in the lower part of the Chalk Group but decrease significantly higher up. Nodular beds and ‘hardgrounds’ indicate some variation in the depositional conditions. Flint occurs as nodules and thin seams. It is relatively rare in the older Grey Chalk Subgroup (K5), and common in the White Chalk Subgroup of the southern crop. In the east coast outcrop flint is present in the middle of the sequence, in the Welton and Burnham chalk formations (K6), and rare in the lower Ferriby Chalk and uppermost Flamborough Chalk (K6). The silica was probably derived from biogenic sources such as sponges, radiolaria and diatoms. The characteristic knobbly form of some flints is attributed to their formation as burrow fills. Wolf Rock south-west of Land’s End is an igneous intrusion (phonolite; K ) of early Cretaceous age, and takes the form of a volcanic plug. Although the outcrop is unique in UK ‘onshore’ geology, igneous rocks, mainly basalt, are recorded offshore interleaved with early Cretaceous strata in the western English Channel. Church wall at Crawley, West Sussex. P211084. Part of the wall at Great Shelford railway station, Cambridgeshire. P667873. 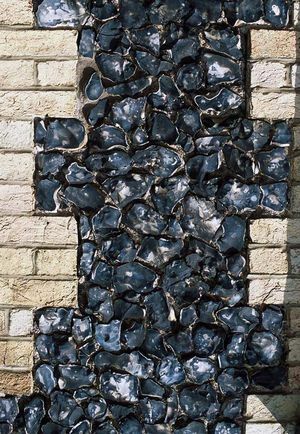 Church wall in Haslingfield, Cambridgeshire. P667874. 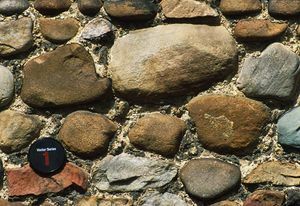 Very old walls can provide a useful visual summary of the rocks that occur locally but may no longer be exposed in the area: the building material was usually worked from nearby sources because transport of stone was expensive and troublesome. In this 13th century wall at Crawley (Plate P211084), the uneven blocks of sandstone are probably from the Upper Tunbridge Wells Sand and the dark brown slabs are clay-ironstone from the Weald Clay or the Upper Tunbridge Wells Sand. 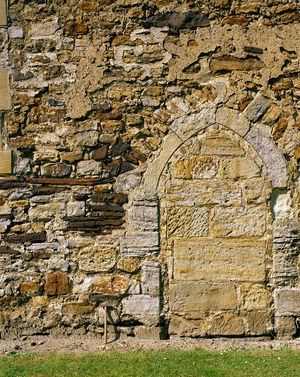 The old doorway is walled-up with large dressed blocks of sandstone, probably from the Lower Tunbridge Wells Sand. All have been worked from the Wealden Group in the vicinity. Rounded boulders used in the church wall at Haslingfield (Plate P667874) were most likely collected from nearby fields. The variety of different stones suggest that they were transported into the area by glaciers although they may have been subsequently reworked into river terrace deposits. The handsome knapped flints (Plate P667873) used in the railway station at Great Shelford could have been extracted locally from the White Chalk Subgroup. This page was last modified on 28 July 2015, at 17:08.